Here comes the first test of a tilt-shift lens on this forum and for several reasons. Firstly the models which, so far, have been available on the market, with price tags getting to almost 10,000 PLN, belonged to top-of-the-range shelves and were produced by very reputable companies. For such an amount of money the companies don’t skimp on anything and if you can afford such a piece of equipment you really don’t have to worry about any risks involved. 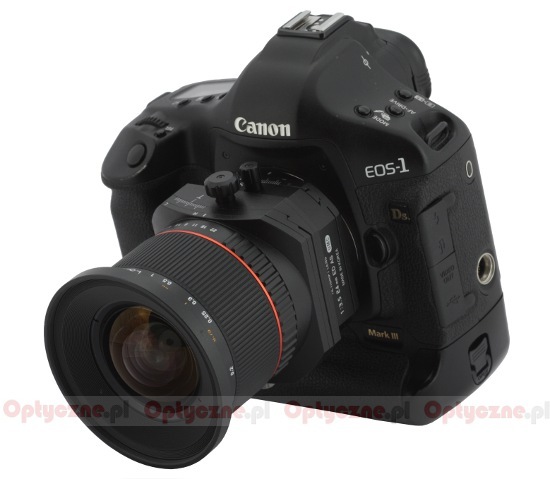 By the way the mere fact that you have to own such an expensive, specialist device indicates that you are aware of your own needs, you know the situation on the market very well and you don’t have to read any tests to make up your mind what lens to buy. There is also another, not less important factor. When it comes to tilt-shift lenses the mechanics dominates over the optics. Of course the images provided by that type of equipment should be good but they don’t have to be excellent. Why? If you need such a type of lens to take buildings and architecture photos using all these shifts and tilts, more often than not you stop down the aperture to values ranging from f/8 to f/22 because you want to fit entire big objects in the depth of field. In that range of apertures even average optics can be limited mainly by diffraction so it doesn’t matter whether a lens can break resolution records by f/4.0 – you won’t use that aperture anyway. Even if you decide to set a tilt-shift lens near the maximum relative aperture it will be just to play in a creative way with an untypical layout of fuzzy areas – and in such a case the blur will be far more important than areas of focus. Apart from that, when you employ a tilt and/or a shift you introduce huge off-axis aberrations to the lens+sensor set and in such a situation looking for maximum MTF values would be a rather strange exercise in futility. So the mechanics part of any tilt-shift device is far more important than the optics but during a short test period - one or two weeks - it is difficult to assess it in a comprehensive way. That’s why here the opinions of users are far more important than classic tests as they can say how a lens performs several years after the purchase. 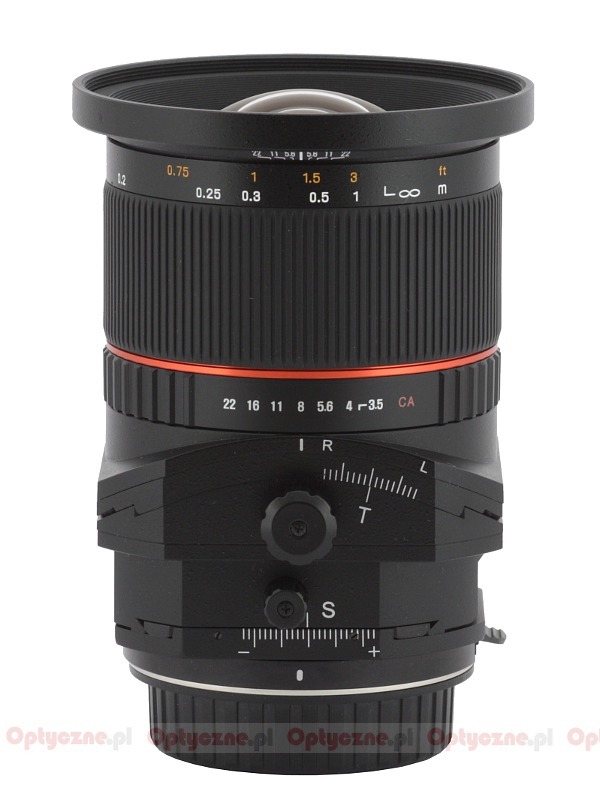 The situation, outlined above, changed slightly in September 2012 when the Korean company Samyang informed that they had been working on the launch of the Samyang T-S 24 mm f/3.5 ED AS UMC, an instrument several times cheaper than similar constructions of more reputable rivals. Because of such a significant reduction in price a wider group of photographers, more and more amateurs among them, can get interested in this kind of lens; those people will certainly be curious what an optics test can tell them, whether they should spend their hard-earned money on the Samyang which, even though noticeably cheaper than the competitors, can hardly be called low-priced. 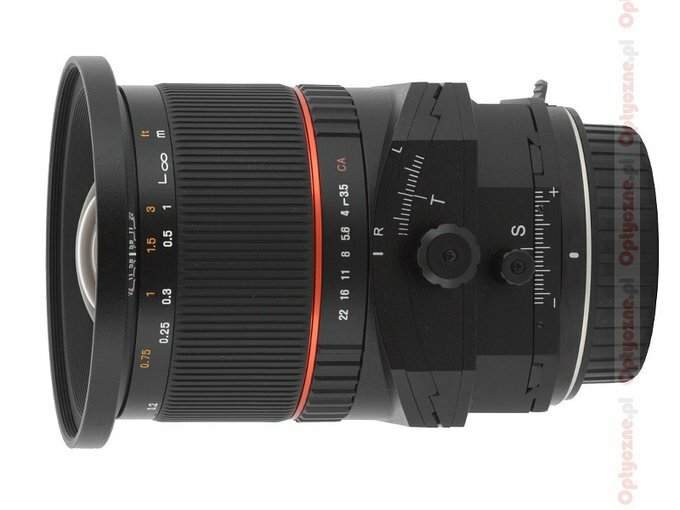 That’s why we decided to take a closer look at the new Samyang T-S device. We would like to thank the Foto-Tip company which delivered the lens to our office without any delay, making such a test possible.